It’s a very common problem among job applicants. Hiring staff who have engaged in résumé fraud can lead to further corrupt conduct, damage an organisation’s reputation and negatively affect other staff. Employment screening is a simple approach that can prevent such applicants from being hired. Staff who have committed résumé fraud are hired all too frequently. According to conservative estimates, 25% of people lie on their résumé and several high profile organisations have hired individuals for senior roles who have engaged in résumé fraud. For instance, retailer Myer discovered that it had hired a general manager for strategic and business development (on a $400,000 salary package) who had an extensive history of résumé fraud, a criminal history and a string of terminations at previous companies. Similarly, Yahoo terminated the employment of it's CEO after discovering that he had listed a false tertiary qualification. Consequently, it is possible that your organisation has hired someone who has engaged in résumé fraud. 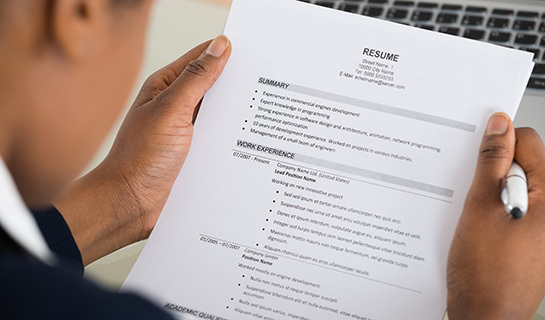 Résumé fraud can have marked detrimental effects on organisations. In the Commission’s Operation Avoca investigation, an engineer fabricated his employment history and used false references to obtain senior engineering positions at numerous regional councils. One general manager commented that the cost of hiring him “far exceeded any benefit to the community”, as he was unable to perform his duties properly and adversely impacted the morale of other council employees. Similarly, Queensland Health faced severe financial and reputational consequences when it hired a person for a senior financial position who had committed résumé fraud and had a criminal history of fraud. In addition to defrauding Queensland Health of $16.69 million, he took excessive leave, failed to adequately complete his duties, submitted poor quality work and bullied staff. In many of these cases, simple and relatively low-cost employment screening checks would have prevented these organisations from hiring these individuals. For example, in Operation Avoca, a simple web-based search would have revealed that the engineer claimed to have worked at a company before it had even existed, and calling a landline telephone number or calling through the main switchboard would have easily revealed that his referees had been fabricated. In the Commission’s Operation Bosco investigation, an employee was able to use false academic qualifications (certified by a justice of the peace) for over 15 years to obtain a number of lucrative senior positions in the public and private sectors. A simple telephone call to the issuing institution would have uncovered this deception. Employment screening checks can also detect other integrity-related issues in relation to potential employees even if they have not engaged in résumé fraud. For instance, in the Commission’s Operation Sonet investigation, an employee was hired to perform the duties of an information and communications technology manager with a $150,000 delegation despite a known criminal history of fraud. This individual subsequently defrauded the agency of more than $1.7 million. If the agency had properly considered his criminal history when hiring him, they could have prevented this fraud. The Commission is preparing a better practice publication on employment screening to help agencies manage these and other risks.